A number of major English-language websites around the world, including Wikipedia, have blacked out their pages Wednesday, to protest anti-piracy legislation under consideration by the U.S. Congress. Find out what Jeepers Media says about MGM, Grokster, CNET, Disney, CBS, Warner, AOL, LimeWire, Kazaa, MP3, copyright infringement, Viacom, Bittorrent, and SOPA. Talk about inducement … companies that facilitated mp3 downloads sued people for infringement of music copyrights? That’s what Michael Mozart of Jeepers Media says. Jeepers Media is the YouTube account of toy reviewer Michael “Mike” Mozart, the “Product Guru”. 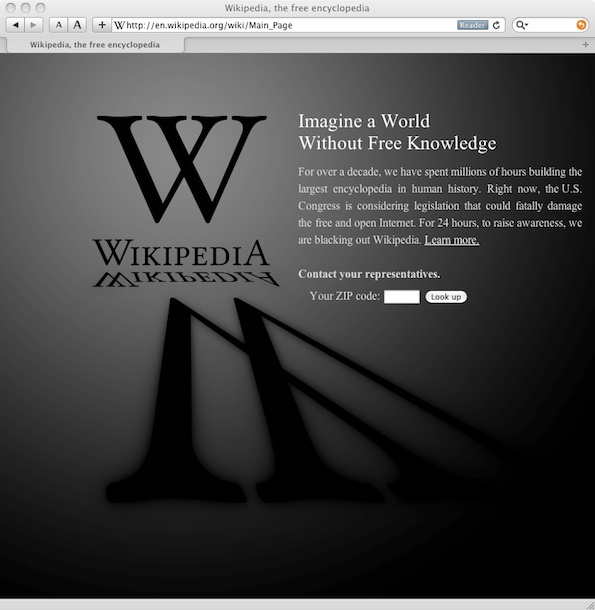 Today, January 18, 2012, Wikipedia, Google and other websites oppose the current SOPA/PIPA legislation. Wikipedia 0500 UTC January 18, 2012 to 0500 UTC January 19, 2012.